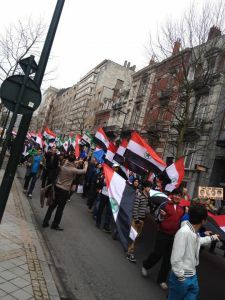 Waving Ahwazi, revolutionary Syrian, Kurdish, Azerbaijani and EU flags, hundreds of indigenous Ahwazi Arabs and their supporters demonstrated outside the European Commission in protest at the Iranian regime's ongoing violent persecution in the Al-Ahwaz region. 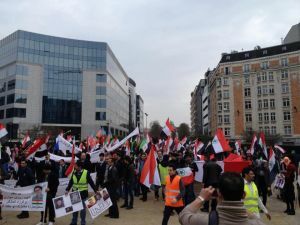 Protesters voiced their support for the hunger strike by six Ahwazi prisoners of conscience, five of whom are facing the death penalty and one a 20 year sentence for their involvement in Arab cultural activities. Four others have also been sentenced to death for political crimes. Speaking to the media, Masoumeh Kaabi told of her experience in prison. She said: "For three months I was kept in the detention of the Iranian intelligence where I suffered physical and psychological torture. Then they transferred me to Sepidar Prison in Ahwaz and I was sentenced to four-and-a-half years." According to the Centre to Defend Families of Those Slain abd Detained in Iran, a further 11 Ahwazi Arabs were sentenced to death on 5 March for threatening national security. It is unclear whether this includes those already known to be facing execution. Meanwhile, the notorious Karoun Prison in Ahwaz City saw violent clashes between prisoners and guards, leading to the detention in solitary confinement of 25 prisoners.